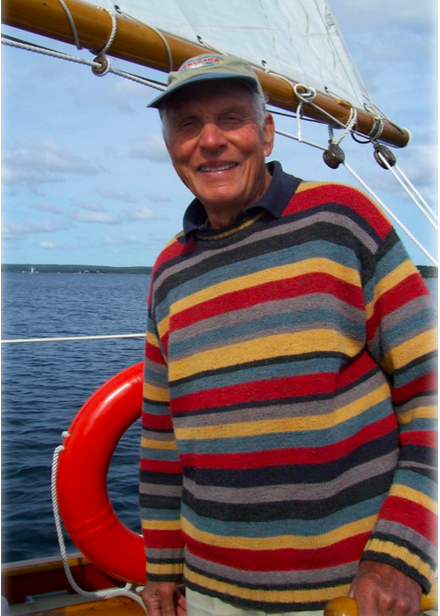 On Friday November 24th 2017 the Friends of Nature and Olga Milosevich co-hosted a wonderful Celebration of Life for our dear friend and Founder Rudy Haase. Over 200 of Rudy’s admirers attended an afternoon of inspirational speakers: Leif Haase, Honourable Denise Peterson Rafuse, Bonnie Sutherland from Nova Scotia Nature Trust, Silver Donald Cameron, and Elizabeth May. Between the speakers were beautiful classical performances by eight symphony musicians, all admirers of Rudy. Prior to adjourning for a reception we all sang “Beautiful Dreamer” a favourite of Rudy’s, led by a terrific young singer with a great future: Abigail Sinclair. The following is the text of Silver Donald Cameron’s eulogy. It’s a great honour to play a role in celebrating the remarkable life of Rudy Haase — and Mickie — and I’m not only honoured, but also humbled. I do, however, wish to register a complaint. This assignment came with a mandate letter from Syd Dumaresq that said, more or less, we’d like you to talk about Rudy’s accomplishments in sailing and boatbuilding, writing and publishing, and social justice. (LONG PAUSE) You have four minutes. Okay, nothing about Rudy’s passion for music, his pioneering environmentalism, his philanthropy. But we can talk about his passion for sailing, which was already in evidence when he was 19 and a student at Black Mountain College. 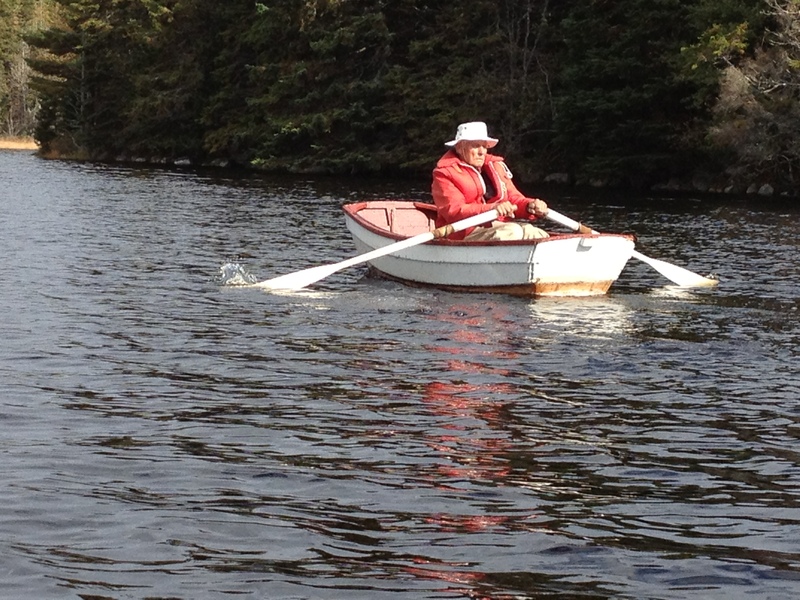 His physics instructor wanted to go sailing on nearby Lake Eden, and Rudy took him out. The instructor’s name was Albert Einstein. Rudy went on to study naval architecture and to become an officer in the US Navy in World War II, where he served with John F. Kennedy. 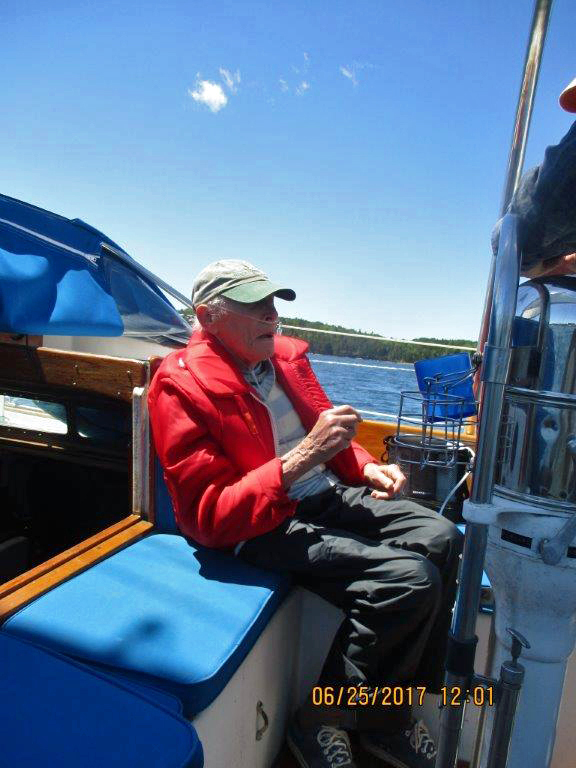 When he and his family moved to Canada in 1967 in protest against the Vietnam War, he bought the Barkhouse boatyard in East Chester, which built a vessel a year for 20 years, with Rudy himself doing much of the finishing and all of the rigging. At the heart of Rudy’s sailing life was Diablesse, the unique main trysail ketch which he and his beloved Mickie bought for a honeymoon cruise, and on which they celebrated their golden anniversary 50 years later. Their voyages in her included two trips south to the Bahamas. The boat was designed and built by Frits Fenger, who wrote a book called The Cruise of the Diablesse about her earlier voyages in the Caribbean. The book was published by Wellington Books of Belmont, Massachusetts. And who was Wellington Books? Rudy Haase, wearing another hat. One of the titles he and Micki published, Gardening without Poisons, by Beatrice Trum Hunter, sold 50,000 copies. It influenced Rachel Carson — who they knew — in writing Silent Spring. The Haases’ writing, publishing and educational work continued when they moved to Canada, founding the Chester Educational Foundation, the Chester Day School and Library, and quietly contributing enough money to ensure that the town’s new school had an adequate library. In the end, environmentalism is inextricably intertwined with social justice, which is why Syd’s letter links the two so closely. I believe that Rudy’s profound understanding of the linkage between environmental devastation and social injustice provided his compass in navigating the choppy waters of politics and war. A fierce sense of justice animated him right to the very last of his innumerable letters to the editor last summer, in which he defended the federal government’s settlement with Omar Khadr. I want to end with a story that’s outside my mandate letter. In 2012, my colleagues and I at The Green Interview learned that more that 180 nations recognize in their legal systems the rights of their citizens to breathe clean air, drink clean water, and eat healthy food. In those countries, citizens can and do defend the natural world in the courts — and they often win remarkable victories. But the handful of nations that do not recognize those rights includes Canada and the United States. We believed that Canadians should know what they were missing, and we decided to create a multi-media project that would tell success stories from all over the world. The capstone of the project would be a feature film. Someone suggested I tell Rudy about it. At the end of a delightful afternoon at his farm, Rudy enthusiastically endorsed the idea, and made a contribution that gave the project a momentum it never lost. He remained among its most ardent supporters right up until his final illness. We finished the Green Rights project in 2016 — three films, 30 Green Interviews and a book — and the feature film has now been screened in scores of communities across the continent, from here to Oregon. I showed it last Tuesday night in Sydney, NS and people in the audience told me — as they always do — that the film had inspired them, motivated them and given them hope. 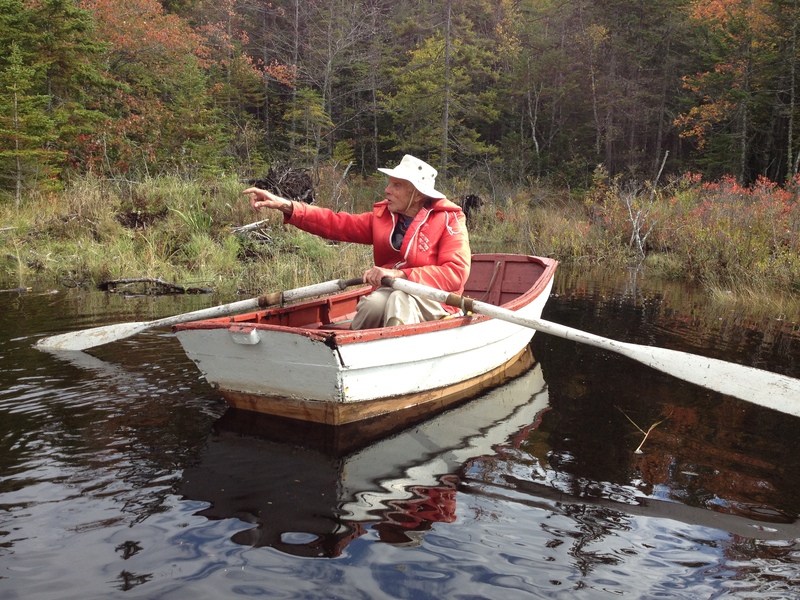 This was a man — and a woman — who loved life: the land and the sea and the skies, the living beings who share our world, the creative spirit that flows through art and music and boatbuilding and that animates our lives together. That spirit is immeasurably stronger for the contributions of Rudy and Mickie. May their example inspire us to leave a similar legacy when we pass from the stage. This entry was posted in Rudy Haase on December 10, 2017 by Friends of Nature. Below is the Eulogy for the Forest given by Bob Bancroft at the recent Funeral for the Forest. The Funeral was a protest march organized by the Healthy Forest Coalition of which FON is a founding member. FON were well represented at the Funeral. WHERE HAVE ALL THE GOOD FORESTS GONE? This forest story began about 12,000 years ago, as an ice age departed. A great diversity of wild plants and animals evolved since that time in this forest, which towered as a green mantle over the land we now call Nova Scotia. It is part of the great land occupied by the Mi’kmaq people. There is a sense of spirit and peace in a natural forest with old trees. Trees in natural forests are allowed to become elders. They soothe our souls and we begin to feel a part of a larger community of other living beings. When settlers from Europe began land clearing in the 1600’s, major disturbances such as human-set fires began. Harvesting with axes and crosscut saws shifted to chainsaws in the 1950’s and then to the large, heavily-financed machinery we see today. To quote Elizabeth May, woods employment went from “a bunch of fellers to a feller-buncher”. Today we are living the latest chapter; an unprecedented loss of NS forests at rapid rates; “forest liquidation” through clearcutting, where even the shrubs may be chipped. Like the cod’s demise, this story of government-sanctioned, forest liquidation is made possible by new technology and fossil fuels. I would like to thank investigative journalists Linda Pannozzo, Joan Baxter and Jennifer Henderson for sifting through the industrial forest rhetoric for the truth. For example, during the 25 years up to 2014, 42% of the forest in Nova Scotia that could be cut was clearcut. On public land currently about 90 % of the cutting is clearcutting. Most of these woodlands had already been harvested several times. Many original tree species lived and still could live natural lives for 350-400 years. So, how did forests become degraded to the sticks we see trucked on highways today? Land disturbance favours short-lived, lower quality pioneer tree species. That’s what naturally grows in here after a clearcut. Forest succession takes much longer after a clearcut. With government backing, the forest industry cuts long-lived hardwood and mixed wood forests that take at least 150 years to establish and mature; and turns them into short-lived softwood stands or plantations. They intend to harvest these every 40 years or so. It is better for cash flow. It’s not better for wildlife. They need food and shelter. All the industry sees in a forest is woodpiles. Piles to be processed into fibre or wood chips to feed hungry mills and biomass burners! The Mi’kmaq, informed biologists and many others see the forest as a living entity that fosters healthy streams for salmon and trout, provides habitat for woodland flora, and habitat for a wealth of animals. The industry respect is saved for profits – the smell of money-most of which goes to foreign shareholders. Priorities include grinding and chipping our forests for fibre. Pulp, biomass and pellets to burn for heat and electricity. Wood chips and pellets are going offshore for chip board and biomass. Saw log supplies are dwindling. Electricity produced by wood biomass is at very poor efficiency rates and cannot be considered green energy by anyone but the most ill-informed and naive. The government is misinforming its citizens with the message that biomass is environmentally friendly. The government also is making poor, short-sighted decisions in a desperate attempt to maintain jobs in a diminishing pulp market. Instead, it could be making brave, innovative decisions that would set us on a new path towards a better future in forest management, forest products, and healthy forests. Many of those ideas were assembled in a report during the Natural Resources Strategy, but none were considered. The problem is large clearcuts leave moonscapes where most wildlife species cannot survive. This removes employment possibilities for decades, and slows new forest growth in nutrient-depleted soils. Global Forest Watch satellite images showing recent forest cover loss in Nova Scotia in the past 10-15 years are appalling, but true. With the Acadian forest now gone in many areas, we are gathered here to mourn its tremendous loss. Now industry-led spin doctors have launched an “Act for Healthy Forests” campaign seeking support in New Brunswick and Nova Scotia for another budworm spray program. The forest industry and DNR refuse to work with the forces of nature. Instead they steadfastly ignore and seek to overpower those forces. They’ve created a worse problem with their few-species, unstable, simplified forests, more vulnerable to forces of nature like wind and spruce budworm. Climate change is bringing hurricanes more frequently and invasive pests. Nova Scotia is adding to the climate change problem, rather than dealing with it. This brand of forestry creates growing numbers of Species at Risk. 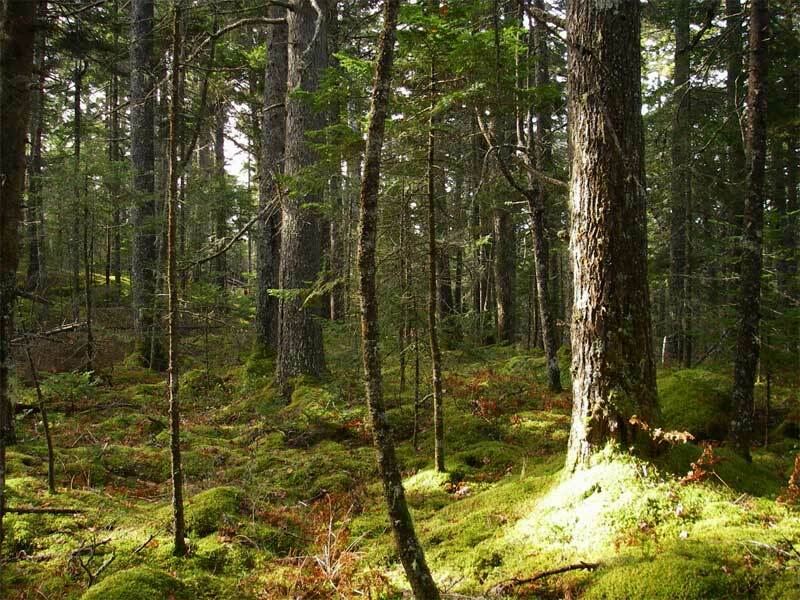 Nova Scotia needs ecologically-healthy working forests that connect isolated patches of protected areas to one another. If such corridors existed, wildlife would once again be able to move freely throughout the province under continuous forest canopies…rather than finding themselves in remnant forests without sufficient food, stuck between barren lands of clearcuts and future plantations. This would create more genetic diversity, and increase chances of survival of wildlife populations. 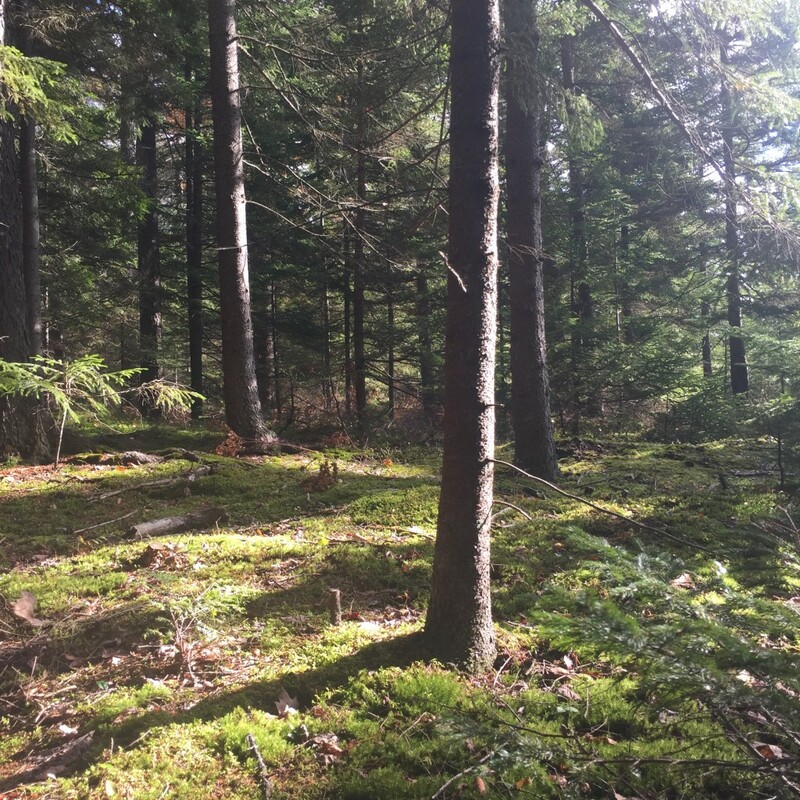 Large clearcuts are too drastic a change for Nova Scotia’s nutrient poor forest soils, the waterways, wildlife, woodland plants including mosses and lichens, and complex communication networks of fungi that actually allow trees to communicate. Streams and rivers run brown with silt, killing fish. Nutrients flush away to the sea, leaving depleted soils and meagre prospects for regenerating plants. This ongoing tragedy has been sanctioned by successive governments of all political stripes. We, the public, the taxpayers, elect them; but politicians listen to the forest industry and their promises of jobs. And politicians continue to feed forest industries hundreds of millions of our tax dollars. Put simply, Nova Scotia is overcut. Why would DNR sanction the harvests of 35 year old stands on Crown land unless we are running out of wood? The public had their say in a round of consultations that ended in 2009. The status quo in forestry was not an option, they said! But DNR hasn’t budged an inch. Instead, they added large biomass plants and became more secretive. They are now allowing the mining of the last of our forests for foreign interests. Are we going to just sit back and take this? Is this the change that you said you wanted to see? In reality they cater to corporations and investor greed. Donna Crossland and I volunteered for a year and a half on a government science panel where the industry rep would not accept science! Now he’s one of those at the helm of Natural Resources, along with other former mill employees. Instead of setting a good forest management example on public lands for private woodlot owners to learn from and to follow, contractors are being allowed to skin Crown woodlands alive. They’re clearcutting everything from mature sugar maples and yellow birch, down to two inch diameter red oaks, as well as whole forest stands long before they mature; chipping or pressing pellets, and sending these raw materials overseas. Stands of twenty and thirty year old trees are now fodder for their harvests. It’s a government and industry-organized race to the bottom. Meanwhile, local, value-added hardwood flooring industries have been forced to close for a lack of hardwood supply. There is room for an expanded maple syrup industry here, and we have the trees. Or we did. But they allow sugar maple stands on Crown (public) lands to be cut, instead of leaving them for syrup operations. And they are already beginning to tax the wood out of private lands. One senior DNR staff member informed me last winter that a fifteen year old clearcut has everything that our wildlife populations need. DNR should be hiring better-educated staff. We must demand the ‘ousting’ of industry people, hired by the Liberals, from DNR. This government department is supposed to act as stewards over the forests and on behalf of the best interests of its citizens. I wonder how the senior DNR person would shoehorn a barred owl into a nest hole in a 15 year old tree? As a scientist, I call it “ecological dismemberment”. Scotland used to be a forested country. Now trees make up 3% of its landscape. This may be a mock funeral, but if you are one of many forest wildlife species displaced by a large clearcut, you lose your home, become a refugee on what was your territory, and most often die a slow, miserable, quiet death from starvation or territorial disputes. Forests are the lungs of the earth, filterers of water, and they provide spiritual wellness. If tended in an ecologically sustainable manner, they also provide us with many things we need, including lumber for our homes, and wood for our fires. Do you want to take back our forests from foreign-owned mills and DNR? Then let’s do it together! We need to work together to become better stewards and make the Acadian forest truly healthy again. Forests can be resilient over time. There is room for hope. Thank you for gathering today to mourn the demise of Nova Scotia’s ecologically-healthy forests, and their wildlife. Before the last of our unprotected public forests are reduced to mud and bushes. This entry was posted in Clear Cutting, Conservation, Ecology, Nova Scotia and tagged Funeral for the Forest on December 2, 2017 by Friends of Nature. 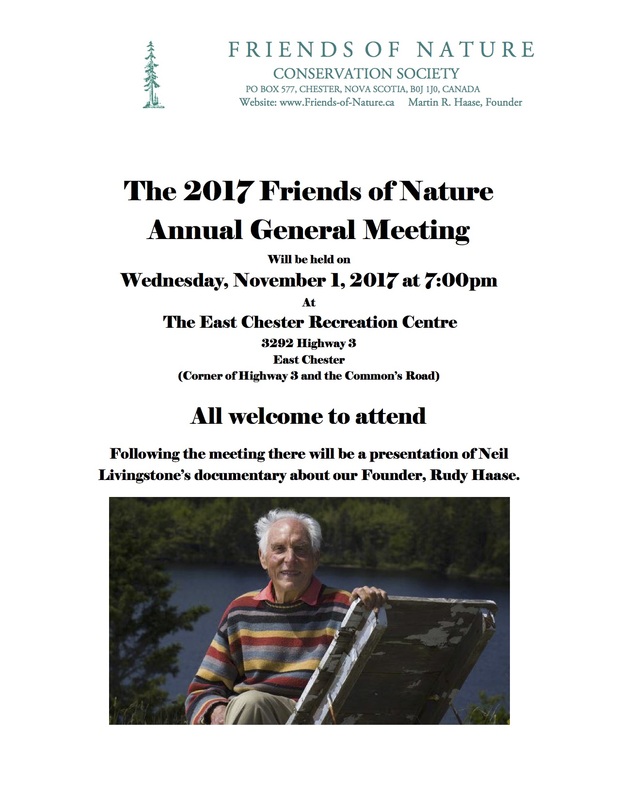 This entry was posted in AGM, Events, Local Events on October 27, 2017 by Friends of Nature. This entry was posted in Local Events, Rudy Haase on September 29, 2017 by Friends of Nature. Rudy Haase, ONS. Nova Scotia lost a great citizen on the evening of August 22, 2017. Martin Rudy Haase was both humble and mighty. As Founder of the Friends of Nature Conservation Society in 1954, Rudy was an environmentalist before the word was even coined. Through his leadership, environmental successes occurred worldwide. Rudy’s dedication, enthusiasm and quiet determination knew no bounds: the last dry tropical forest in Costa Rica was preserved, an historic row of plane trees along the Charles River in Boston was saved from destruction, McGlathery Island in Maine was rescued from clear-cutting and became a nature preserve. Rudy was active on site during the Clayoquot Sound campaign. 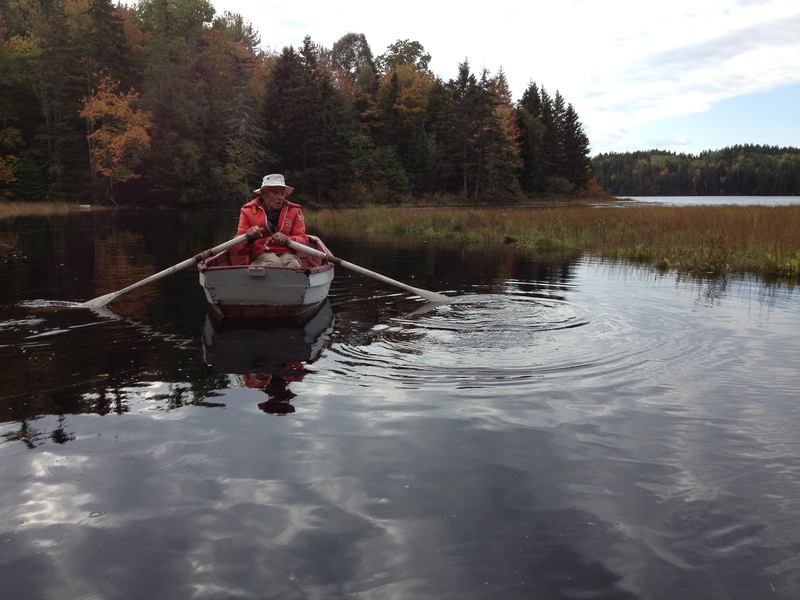 Here in Nova Scotia Rudy became a leader in land conservation—purchasing and donating large parcels of wilderness. Rudy and his wife Mickie Haase (predeceased) were educators, operating the Chester Day School and Library for the benefit of residents of the Chester area. Together they wrote and published books. One of their early publications “Gardening Without Pesticides” sold almost 50,000 copies and influenced Rachael Carson in the writing of Silent Spring. 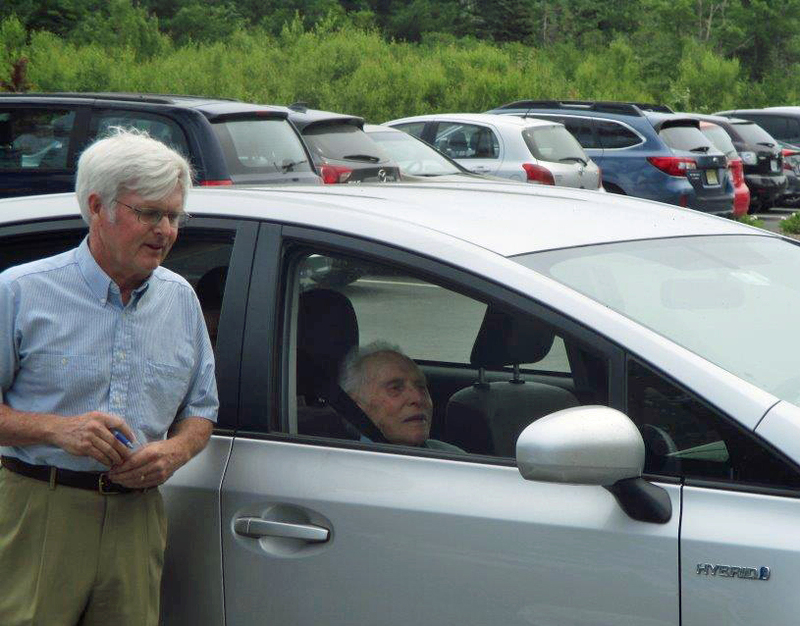 Rudy and Mickie were exceptional supporters of the arts, especially Symphony Nova Scotia and music in general. 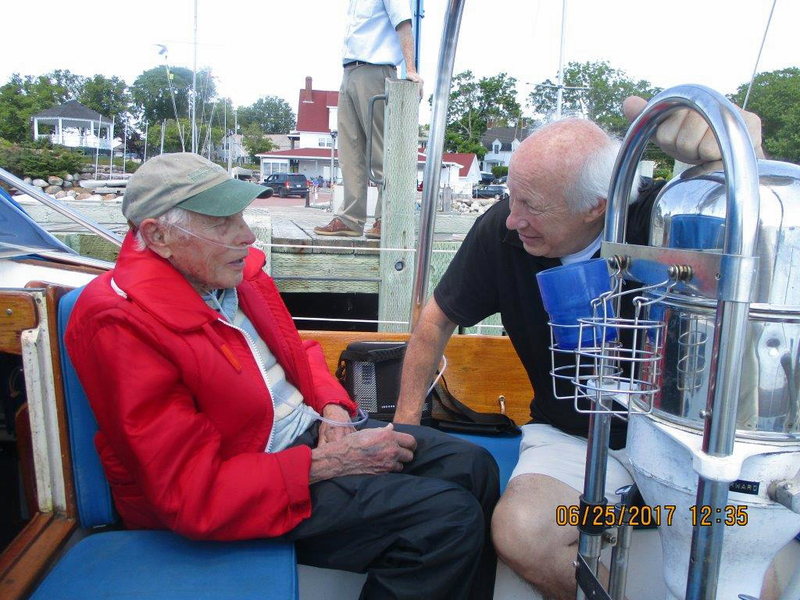 Rudy, a naval architect by education purchased and operated the Barkhouse Boatyard in East Chester, employing local craftsmen and helping to preserve the wooden boat building industry. Sailing was one of Rudy’s first loves. This made the boatyard, a few steps from his home at Goat Lake Farm, a great fit. Rudy, a storyteller extraordinaire with a superb sense of humour, would enthrall visitors with endless stories of his life, usually conveying two underlying messages: we can make a difference and we should never lose hope. Rudy was a prolific letter writer: penning thousands upon thousands of letters to the editor and politicians from President Kennedy on down. Rudy lead by example and was a mentor to hundreds, including Elizabeth May, leader of the Green Party of Canada. Nova Scotia has lost a gem. His like may never be seen again. This entry was posted in Rudy Haase on August 26, 2017 by Friends of Nature. 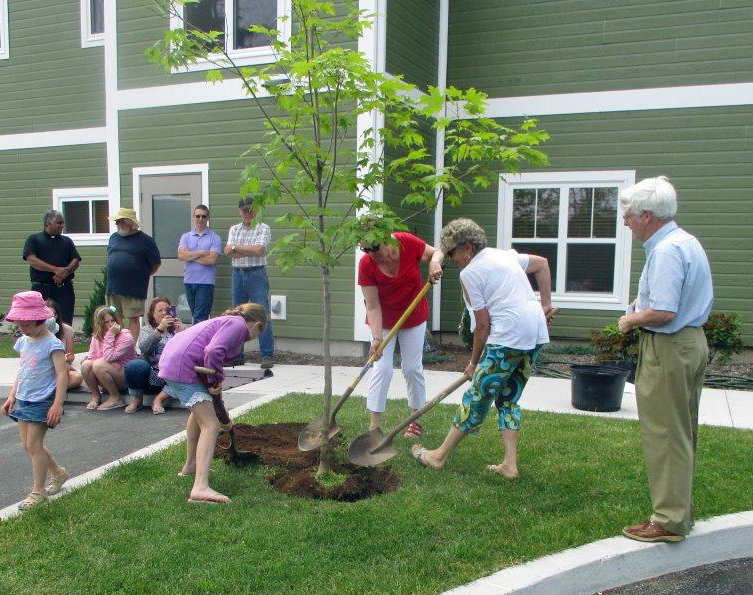 On July 17 the Friends of Nature planted two beautiful sugar maples at Our Health Centre in Chester, Nova Scotia to celebrate Canada’s 150th Birthday. Someday the maples will tower over the building giving it life and scale. This entry was posted in Chester, Events on August 25, 2017 by Friends of Nature. 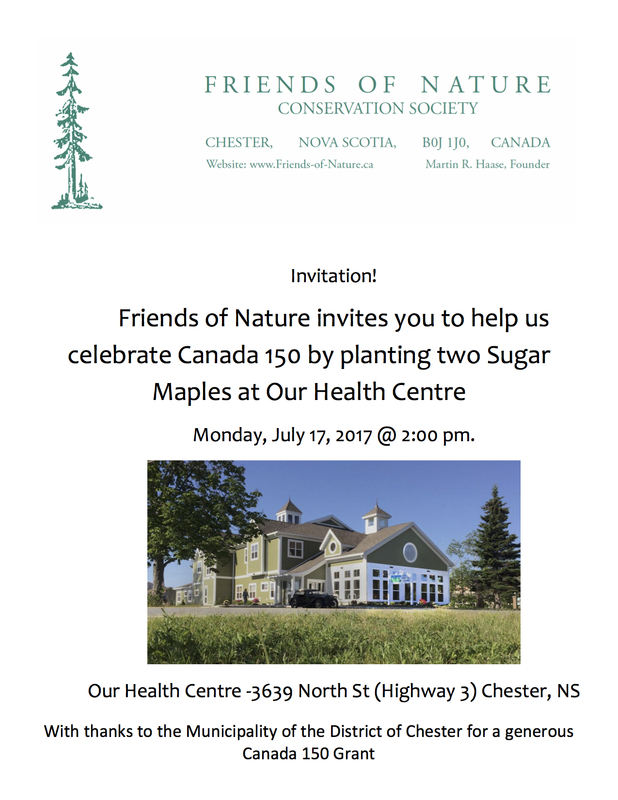 This entry was posted in Chester, Events on July 10, 2017 by Friends of Nature. We just wanted to share some pictures of an outing with our founder, Martin Rudy Haase on June 25, 2017. A good time was had by all! This entry was posted in Local Events and tagged Martin Rudy Haase on July 8, 2017 by Friends of Nature. Clean air and water—the source of life. In many nations, the law recognizes the legal rights of citizens to these essential elements of survival but not in Canada or the United States. And that’s what Green Rights is all about. 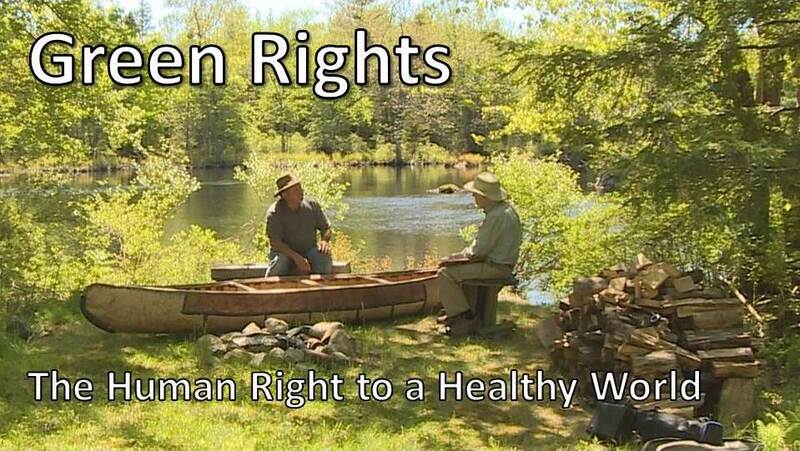 Green Rights: The Human Right to a Healthy World will be shown at 7:PM Friday, May 19, 2017 at the Mahone Bay Centre, 45 School St. 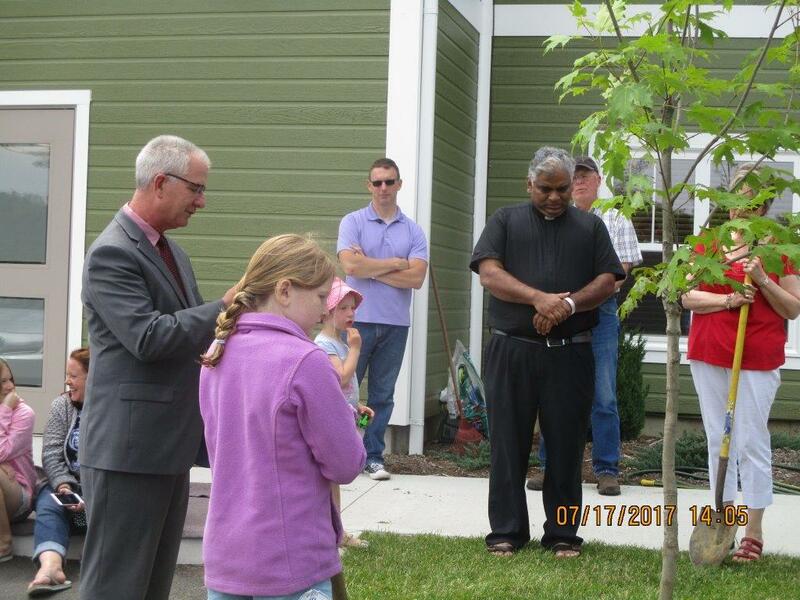 The event is co-sponsored by the South Shore Chapter of the Council of Canadians and the Friends of Nature. It will be hosted by film writer and narrator Silver Donald Cameron. Green Rights tells the stories of ordinary people and dedicated lawyers who are suing multinational corporations and unresponsive governments on behalf of future generations. And they are winning in places such as Argentina, the Philippines, Ecuador, and the Netherlands. Cameron and film director Chris Beckett captured footage and compiled interviews from eleven countries on every continent except Antarctica. Cameron is also the author of the companion book Warrior Lawyers: From Manila to Manhattan, Attorneys for the Earth, which will be available at the event. Admission is by donation. Light refreshments will be available. This entry was posted in Local Events on April 21, 2017 by Friends of Nature.